Now that we're a few years into our life in Colorado we're starting to find a few races we like, and doing them each year. 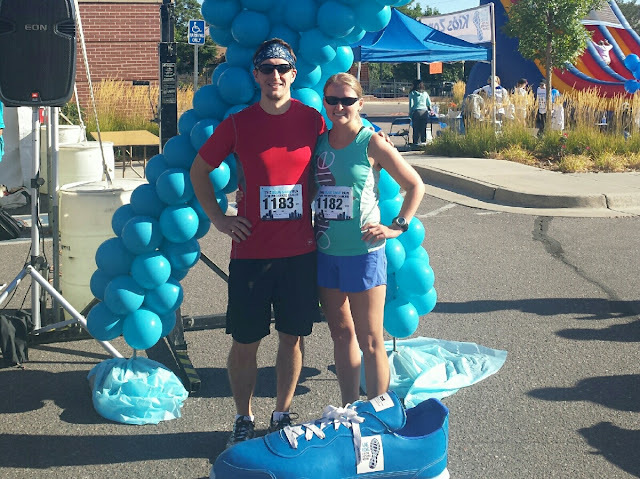 This past Saturday was the Blue Shoe Run for Prostate Cancer which raises funds for the The Urology Center of Colorado. I'm not sure saying it's a run for prostate cancer, is quite the best description of the race - in both that it's a run and walk (I think more people likely walk than run, actually) and that the race raises money for cancer research in order to increase the number of men in the local community who are screened, and to support community programs and research. I'm still working my way back from my injury so I didn't have any goals for this race beyond putting in a strong effort and to enjoy the experience. Woody, however, wanted to break 7 minute miles. While I sometimes struggle with the fact that running has come quite easy to him, much easier than it is for me, I do love to see him excited about running and setting running goals. I wrote a good bit about this race last year, and since it wasn't all that different this time around I won't get into all the details here, but it is a very low key event that starts with a kids race before the 5k run start and then a 1.5 mile family walk. There are a ton of families at the event - kids in strollers to grandparents. 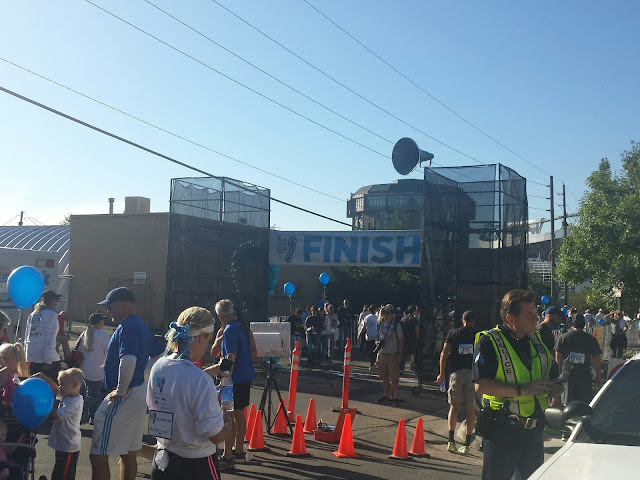 The race is for a good cause: prostate cancer is the 2nd most common cancer in American men, about 1 in 7 will be diagnosed in their lifetime. These numbers are pretty staggering and while it's fantastic that this event had more than 1,200 participants, events raising funds to fight prostate cancer aren't nearly as popular as those for breast cancer. I'm glad we were able to participate and we plan to do so every year we're able to. If you are thinking about running this race - and I hope you are - I'll warn you about a long hill towards the end that goes up a freeway onramp then turns left and keeps going up. If you want to hit a certain time, like Woody did, you have to keep this in mind and save energy for it. For those who want to give back in a meaningful way, I met a man who is a participant and volunteer for Live by Living, a non-profit organization that provides cancer survivors and their caregivers with opportunities to connect with nature and each other. The organization leads walks, day hikes, snowshoe outings, and 2- and 3-day retreats, all at no cost to the participants. To do this, they rely on volunteers to lead and support the various events. A lot of people stick around after the race to enjoy the food, music, silent auction, and hear the presentations. There's also a large "survivors oasis" which looks like a serious party from the outside. As for Woody's goal - he clocked a 6:44 min/mile pace! So proud of him! 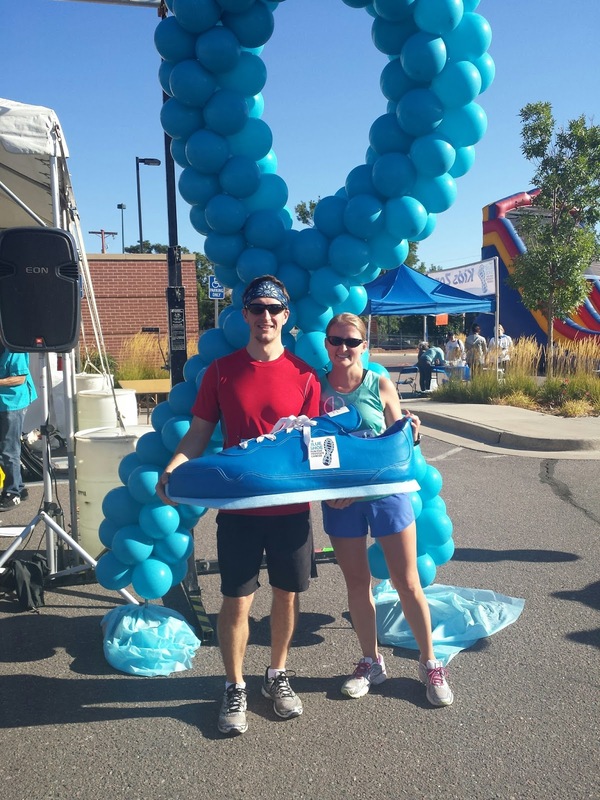 Do you participate in a fundraiser race that you'd like to let people know about? * Have you reached a goal in your running recently that you want to share?